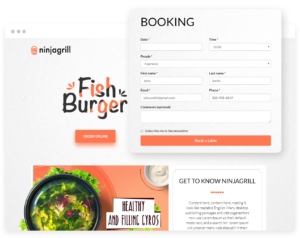 A restaurant online booking system is a solution that helps with better organisation of a restaurant’s work, increases the number of customers, and hence boosts profits. How should this tool be launched and what does it involve? The UpMenu online booking system will help you resolve many problems, and launching it will take you only a few moments. Developing your own solution or choosing a system that’s already available on the market? If you decide to develop your own online reservation system, you have to be prepared to incur high costs, both in terms of launching the system and its maintenance. No solution that you pay for once will work endlessly. Expensive updates and modifications will be required. Additionally, such solutions tend to be short of functions. For an online booking system to operate properly, it has to be user friendly and easy for you to use. This is why a more advantageous solution is to launch the Upmenu online booking system, available as part of the regular subscription. With this low monthly fee, you also receive free technical support services. The UpMenu system is updated on an on-going basis so you can forget about the risk of failures. This intuitive system will provide many customer reservations and your employees will be able take those reservations easily. Who can launch an online booking system? 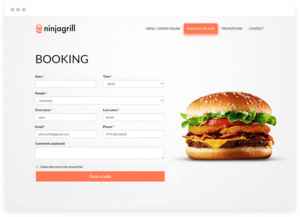 Whether you manage a small bistro or a large restaurant chain, you can launch the online reservation system. Thanks to many years of experience in the restaurant industry, the UpMenu system will be ideal for all types of restaurants. All you have to do is take reservations for tables at your restaurant. Thanks to the online booking system you will increase the number of customers visiting your restaurant. Does it often happen that the telephone line at your restaurant is busy during rush hours and this irritates your customers? Perhaps, one of your employees made a mistake when noting down details of a table reservation made via telephone? The UpMenu online booking system will solve all those problems for good. All reservations can be taken simply with just one click. Thanks to this, customers will not get frustrated by a busy telephone line. Your employees will not make mistakes when noting down dates or details of reservations. This way you won’t lose customers and you will earn more. Additionally, the online reservation system is integrated with the UpMenu online food ordering system, and the pre-order feature will help you limit the number of reservations that people cancel. When booking a table, the customer will be able to make an order immediately and pay for it online. This way you can be sure that the customer will appear and the money for the meal has already been transferred to your account. Thanks to the online booking system, you can organise the work at your restaurant in a better way. You will know how many customers you can expect so you can plan the optimum number of employees for a given day. 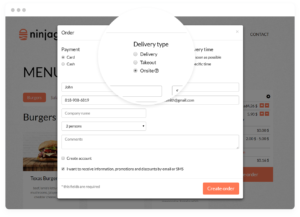 If you own the UpMenu online food ordering system on the restaurant website, online reservations can be enabled with just a few clicks. If not, implementation of the online booking system onto your website is also very simple. Contact us to find out more. A good online reservation system for restaurants must be functional for both customers and your employees. This is why it is so important for the solution you choose to ensure good quality. The UpMenu online booking system will help you generate bigger profits and organise work at the restaurant more efficiently. Implementation of the system on your website is very simple. Find out more about the advantages of online reservations in the article entitled: UpMenu online booking system and pre-ordering.